What is the difference between a 1-1 and 1-X Grade? All of our grape vines are one year old field grown dormant vines that have been field trimmed to encourage additional root growth. You can expect approximately 6 inches of top growth and at least 12 inches of root on our standard 1-1 Grade. 1-X grade vines will have a heavier root system. 1 - 1 Grade: These are our standard size vines and they represent the majority of the vines available. These vines have a good root system to support the vine at planting and have exhibited good health in the field. 1 - X Grade: These are still one year old vines but they have a heavier, more solid root structure and have exhibited above average growth the first year. What does "2010 Protocol" mean? What can I expect in my shipment? Our plants are considered “bare root”. Usually, when they are shipped, they have moist packing material around the roots and should arrive in very good condition. It is important to keep the plants cool and the roots moist prior to planting. What if I am unable to plant right away? A cooler, garage or basement room is typically good storage locations for your plants if you can’t plant immediately. Plants will be fine in the packages they are shipped in for up to 2 weeks however; the packing paper may need to be remoistened after the first week in storage. The storage area temperature for the plants should not dip below freezing. Dormant plants should not be stored near apples or other fruits as the ethylene gas produced could be toxic to the buds. What is included in my shipment? A packing slip should be included on your package outlining each variety in your order. Additionally, each plant will have a plastic tag denoting the variety, size or rootstock (depending upon the type of plant). If more than one plant is ordered, all like varieties will be bundled together up to a quantity of 25. Before planting, do I need to amend my soil? Typically, there is no need to amend the soil but up to 50% peat moss can be added if desired. If you have concerns about your soil prior to planting you can test your soil with our Soil Nutrient Testing Package that includes a full review of the results by our viticulturist and a detailed summary of how best to adjust the conditions of your soil to promote healthy plant growth. When I am ready to plant, is it okay to soak the roots in water? We recommend soaking the plants in water for several hours prior to planting but no more than 24 hours. When the plants arrived, some tender shoots had started to grow. Is this okay? This growth is referred to as “etiolated” shoots. These shoots indicate that the plants are alive. They develop when the plants break dormancy while in storage or in transit. When exposed to the sunlight, this growth will turn brown or fall off. Grapes are unique in that they have primary, secondary & tertiary buds. There are also many latent buds that can develop. The plants will continue to grow. How do I plant my grapes? First, you need to determine if the plant is grafted or own rooted. A grafted plant will be tagged with a rootstock designation such as 101-14, 3309, or 1103P and have a “knot” where the plants were joined together. An own rooted plant will be designated as size 1-1 or 1-X. 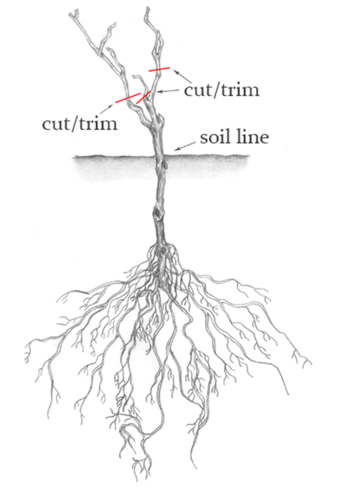 The graft union (knotty section) should be planted 2-3 inches above the soil surface. The hole for the plant should be 1.5- 2 times the diameter of the root system. When planted, all roots should be spread out. 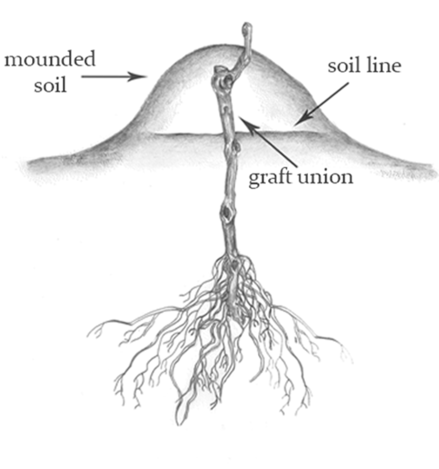 Immediately after planting, the graft union should be covered with soil to protect it and harden it off. Once the plant starts to grow, the soil should be removed or the plant may root into the soil, defeating the purpose of the graft. It is also important to cover the graft union before winter if you are considered zone 6A or less then remove the soil in the spring each year. Make sure to dig a hole big enough to spread out the roots. There is no need to trim the roots prior to planting. If desired you can trim roots to 8 inches to help in the ease of planting. Balling up the roots inside a hole that is too small may stunt the plant. When planting large quantities, it is recommended to dig a trench, spread out the roots horizontally and backfill with dirt. Position the plant at the same depth as is evident on the plant – roots under the ground with shoots above. If there are more than two shoots coming out of the top of the plant, it can be trimmed to the two strongest shoots. Each shoot can be pruned to 2-3 buds, leaving 4-6 buds on the plant. How far apart should I space the plants? Refer to the Grapevine Characteristic Chart available in your Double A Vineyards catalog or in our Growers Guide. Each variety has recommended spacing to give optimal productivity per acre. Home gardeners can be flexible with which spacing they choose to use due to aesthetics or site constraints. After I planted my grapes, my area was hit with a frost. Should I be concerned? It is best to plant grapes as soon as the ground can be worked. If there is a frost, primary bud damage may occur. The secondary and tertiary buds will continue to develop and the plant will grow. How much water do my plants need the first growing season? Plants should be watered when planted. Grapes require an inch of rain per week or the equivalent during the first growing season. During a dry season, watering every 7-10 days becomes necessary. How do I protect my plants with the Blue-X or Plantra vine shelters? Immediately after planting, the Blue-X and Plantra vine shelters can be put over the plant. The vine shelters can be attached to a bamboo pole, stake, wire or trellis to maintain the upright position. This will protect the tender foliage from “critter” damage as well as allow herbicide to be sprayed around the plants to minimize competition from other vegetation. When do I remove the Blue-X or Plantra vine shelters? The best time to remove either vine shelter is after the plant goes dormant in the fall. The foliage will no longer be appetizing for deer or other animals and there will be no need for weed sprays. We do not recommend leaving the shelters on during the winter as this may create a greenhouse effect. Should I fertilize my plants? There is no need to fertilize the first year. The fertilizer tends to promote too much vegetative growth. In the second year, triple 15 fertilizer can be used, sprinkled in a 6-8” diameter around the plant. What about sprays for diseases and pests? Please check out Double A Vineyard's product offering to help you protect your plants from disease and pests. A cooler, garage or basement room is typically good storage locations for your plants. The storage area temperature for the plants should not dip below freezing. Dormant plants should not be stored near apples or other fruits as the ethylene gas produced could be toxic to the buds. A packing slip should be included on your package outlining each variety in your order. Additionally, each plant will have a plastic tag denoting the variety. If more that one plant is ordered, all like varieties will be bundled together up to a quantity of 10 or 25. Refer to each section listed below for the specific requirements for each type of plant. Backyard fruit and berry plants will do best by providing the specified conditions. How do I plant my RHUBARB? Once you have determined where you are going to plant, make sure that the ground is tilled up and weed-free. Ideally, all perennial weeds should be eliminated prior to planting. Rhubarb grows well on soil enriched with organic matter that is fertile and well drained. Rotted manure is a good soil additive. The ideal pH range is 6.0-6.8 but rhubarb will tolerate pH as low as 5.0. Plants should be spaced 2-4 feet apart, with rows 3-4 feet apart. Plant the roots with the top of the plant approximately 2 inches below the surface of the soil. Compact the soil around the plant but leave the soil loose over the buds. Water after planting and fertilize with ¼ cup 5-10-10 worked into the top of the soil. Each spring, a cup of 10-10-10 fertilizers should be broadcast around each plant. No rhubarb should be harvested the first year, as all of the energy should be focused on the development of the plant. If seed pods develop, they should be removed. In the second year, a light harvest may be made, cutting the rhubarb at the base of the stalk or pulling it out individually. How do I plant my CURRANTS, GOOSEBERRIES, & ELDERBERRIES? Set plants slightly deeper than they grew in the nursery. Prior to planting, cut the shoots back to 6 to 10 inches above ground level. Currants and Gooseberries may be planted 2-4 feet apart with rows 6-8 feet apart. Elderberries may be planted 7-8 feet apart with rows 10-12 feet apart. Apply mulch around the base of the plants to conserve moisture and control weeds. Place 2 to 4 inches of straw, grass clippings, sawdust, or wood chips around each plant and replenish annually to this depth. How do I plant my BLUEBERRIES? Blueberries thrive in acid soil with a pH of 4.0-4.5. Soil should be rich in organic matter and well drained. The soil may be amended with up to 50% peat moss. Plants should be spaced at 3-foot intervals in rows 8 feet apart. Raised beds work well for blueberries, providing the necessary drainage. After planting, a heavy 3” pine mulch lay provides some of the acidic organic matter that blueberries require. How do I plant my BLACKBERRIES, RASPBERRIES? Blackberries and raspberries or brambles like full sun and well-drained soil. Planting in raised beds is recommended for extra yield and optimal long-term plant survival. Plants should be placed 2-3 feet apart with 6-8 ft. spacing between rows. Water plants immediately after planting and regularly throughout the growing season if rainfall is less that 1” per week. Berries may be mulched with bark; hay, straw, aged saw dust or landscape fabric might be used for weed prevention. Place the berry plant in a shallow two-inch trench. Spread the roots horizontally, push the plants into the soil and completely cover the roots as well as approximately 2” of the plant. Since the roots are very fine, it is extremely important that the roots remain moist. Berries should be soaked in water a few hours prior to planting and watered well. Don’t let the plant develop fruit the first year. Each subsequent year after fruiting, prune old canes and burn. Mulch plants well. Just before buds open, raspberries and blackberries may be sprayed with lime sulphur or Bordeaux mixture (4-6-50 Copper sulphate, hydrated lime and water). How do I plant my ARONIA BERRIES? For best results Aronia Berries should be planted within the USDA hardiness zones 3-8. Aronia Berries prefer full sun to partial shade and will bloom late spring to early summer. When you receive your plants they will be dormant and can therefore be planted as soon as they arrive. Soak the roots in water prior to planting. Make sure you plant with the crown of the plant (where the stems meet the roots) no more than one inch below the surface of the soil. They should be planted with 5' - 8' between plants and 12 foot spacing between rows. Keep the soil moderately moist but not soggy, watering a minimum of once a week throughout the first growing season. Spread mulch around the base of the plant keeping it approximately 2 inches away from the trunk, as a way to reduce weeds and conserve moisture. How do I plant my GOJI BERRIES? For best results Goji Berries should be planted within the USDA hardiness zones 6-9. You should select a site where the soil is high in organic matter, well drained and neutral to slight alkaline soil. A soil PH of 7 is ideal. Goji Berries also prefer full day sun however they will tolerate half-day sun. When you receive your plants they will be dormant and can therefore be planted as soon as they arrive. Soak the roots in water prior to planting. Make sure you spread out the roots and push soil in and around the roots. Keep the soil moderately moist for the first few months or until you see new growth sprouting. Spread mulch around the base of the plant to reduce weeds and conserve moisture. How do I plant my GREENHOUSE PLANTS? At Double A Vineyards we begin the process of “hardening off” the tender greenhouse plants prior to shipment or pickup. It is important to keep in mind that greenhouse-grown plants should be protected from freezing conditions initially after planting. If cold weather is predicted, cover plants with a pot or box to minimize stress. Plants should be kept moist enough to prevent wilting but not over watered. We recommend soaking the plants in water for several hours prior to planting, but no more than 24 hours. How much water do my plants need during the first growing season? Plants should be watered when planted. Your berries will require 2 gallons of water per square foot of root spread applied weekly. Refer to the specific planting recommendations for each type of small fruit. The “GRAPE GROWING RESOURCES” section on our website also has detailed information readily accessible under the “BERRIES” heading. Please refer to the Double A Vineyards website: www.doubleavineyards.com. Our “Growers Guide” houses several very good resources from different cooperative extensions and universities. We also have book available such as THE BACKYARD BERRY BOOK that provides great resources for the home gardener. If you have purchased willow cuttings you will receive 8” cuttings that have been spray-painted on one end. The spray painted end is the top of the cutting and the opposite end is what should go into the ground when planting. If the cuttings cannot be planted immediately they must be stored in a cool, shady place. If weather is warm and drying, the cuttings must be kept moist by placing them in water for a few hours, and then placed in a fridge until being planted. What do I need to do prior to planting my willow cuttings? We prepare willow cuttings fresh to order. This ensures that the stock arrives in prime condition. It is important that the cuttings are planted as quickly as possible, and have soaked for a few hours prior, to replace lost moisture.We prepare willow cuttings fresh to order. This ensures that the stock arrives in prime condition. It is important that the cuttings are planted as quickly as possible, and have soaked for a few hours prior, to replace lost moisture. How do I plant my willow? Dig a hole in the soil with a metal bar or stick and insert the 8-inch cutting 7 inches into the ground (9-9 ½ inches for 20 inch cuttings). Cuttings should be watered in immediately after planting. Press the soil surrounding the cutting in tight with your heel to make sure there are no air gaps. How far apart should I space my cuttings? To create a dense fedge or hedge we recommend planting your cuttings 2 feet apart and in a two-row layout. The rows should be offset to create a zigzag pattern. How much sun will my willow cuttings/plants need to grow? Willow should be planted on a site that receives full sun for most of the day. What type of soil is best for growing willow? Willow can tolerate a range of soil moisture however it is best if waterlogged soil is avoided, along with very dry soils. How do I know if willow will grow where I am located? Willow is best suited for USDA Hardiness Zones 3-6. Please refer to the zone map to locate which zone you are in. Should I use landscape fabric or mulch? We recommend using 4 ft. landscape fabric for establishing plantings, as willow does not compete well with weeds. Fabric should be laid overtop of a 4 foot tilled section. Tucking the edges of the fabric in can help keep the landscape fabric in place until you’re finished. Make 3 inch X’s in the fabric and plant the cuttings through it. Cover the fabric with bark, mulch or straw to further prevent weed establishment and to retain soil moisture. How much water does my willow need? Your young plants will want plenty of water. Once the buds break and begin to grow make sure that the plant is getting sufficient water – twice a week – through either rainfall or manual watering. Should I fertilize my willow plants? Fertilizing should not be done the first year. You should wait to fertilize until the next spring, after the leaves have come out. What type of maintenance is required from year to year? After the first growing season while the plant is dormant (November-March), cut the plant back to about two to three inches above the soil to stimulate vigorous re-sprouting the following spring. Use sharp clippers to create a clean cut rather than tearing the stems. At Double A Vineyards we begin our young hop plants in the greenhouse. Once the plants have reached dormancy they are placed in the cooler for storage until we are ready to ship. The plants will be dormant when they arrive but will take root quickly once planted. Each pot will have a tag labeling the variety. A packing slip will be included on your package outlining each variety in your order. Additionally, each plant will have a plastic tag denoting the variety. Plants will be in 4 in pots. Pots will arrive shrink-wrapped to keep the soil contained. Upon arrival unwrap the plants to prepare for planting. What is most important when selecting a site? When selecting your site you should make sure that it is well drained and in a location that gets full sun. Hops also require a lot of water so making sure you have access to water for irrigation is important. Good airflow is also very important. Before planting how do I prepare my soil? Hops like most crops need a healthy soil in order to grow. Ideally the pH should be between 6 and 7 and there should be a good level of organic matter. This can be mixed in prior to planting or a cover crop could also be used. How do I plant my HOPS? Assuming your site has been well prepared you will want to plant each hop plant as quickly and efficiently as possible so as not to let the root system dry out. Place plant in the ground with root system completely covered. Water immediately. If you are not ready to plant or it is still too cold you can store them as is for up to 2 weeks in cool dark storage. A temperature of under 42 degrees is ideal for storage. Alternatively you may choose to pot your plants in 1-2 gallon containers until they are ready. Keep the plants well watered until you are ready to plant. They should go in the ground no later than early fall as they do not winter-over well in pots. What if my plants begin to grow before I am able to plant? If your plants begin growing it is okay as they are in pots. Root growth is likely to occur. The more top growth you see the more difficult it may be to plant them without damaging the growing tip. The best practice is to get the plants in the ground as soon as you are able to. How far apart should each plant be spaced? Each hop plant should be placed at least 36-40 inches away from the next plant. The row spacing should be wide enough that you can weed and/or cultivate. What if we get hit with a late frost? If your hops have begun to push shoots and are hit with a frost they will send up new shoots at a cost of additional energy from the crown. It is best to avoid freezing temperatures with new hop plants when at all possible. Once established however, mature hop plants are generally considered to be cold hardy. Your new plants will need at least an inch of rainwater per week throughout the first season. For large hop yards irrigation lines are a must. How much can I expect my plants to grow during their first season? Will I have cones? These plants should grow into a full-grown hop plant this year and should bear cones as well. The cones should be hand picked and the plants should be left trained to the coir so as to encourage growth of the root structure. Will I need a trellis my first year? Hops grow quite vigorously so the sooner you get your trellis up the better. In the mean time feel free to use bamboo stakes to tie them up. By the time the hops reach 3 foot tall they will need to be strung up to a trellis. Do I need to control the weeds around my HOPS? Hops do not compete well with weeds. If a cover crop has not been used to reduce weeds you will definitely need to use a weed killer to clear the perennial weeds and grasses prior to planting your hops. When first planting hops they may need fertilizer the first year. A soil test can tell you for sure what you need however; nitrogen, potassium and phosphorus are key components in hop health. See the “HOPS” section under the “LEARN” tab on www.doubleavineyards.com for more specific information. Please refer to the Double A Vineyards website: a href="http://www.doubleavineyards.com">www.doubleavineyards.com. Our “Growers Guide” houses several very good resources from different cooperative extensions and universities.